We’ve officially been homeowners for two months now. There’s definitely a difference in space between my two room apartment to my (essentially) 2+ bedroom apartment. About a year ago I gave away my dining room set. Some of my family members were talking about pooling money together to get one for my grandparents, and I offered mine, since it was sitting in my sister’s basement. At the time, I assumed I’d keep living in the tiny apartment for another year, and wouldn’t be needing it any time soon. I can’t be too upset about it because the size and shape of it wouldn’t really fit in the space we have in the apartment now anyway, but there is now a need to get something that DOES fit. The temptation is to fill the space with everything that we’ll need NOW. But we really need to prioritize what can wait, and what can’t. For example, I think a place to eat (that isn’t square in front of the tv) and have guests should be high on the list. And yet, we bought a bench for our front hallway this weekend. Does the space look a little silly with nothing in it? Yes. Did we NEED to do that now? No. I think I need to keep myself (and the man, who is as bad as I am) out of HomeGoods for a while, at least until bonus time. I haven’t been trying yet — I’m hoping to make a serious effort in September — but sticking to a budget needs to happen, and right now doesn’t allow for these additional purchases. With the extra monthly income (that we’re currently saving for a house-related emergency fund), buying a house will definitely be cheaper than renting for me. But I can easily see how anyone buying a single family might think that it’s cheaper to buy, then get sucked in to excessive spending with all of the additional needs of a house. I posted this post yesterday or the day before, but lo an behold nothing is there. Whatever, it was posted from the train and had no pictures anyway. I haven’t posted in at least a month, and we’ve closed on the house and moved in. I moved in two days after we closed, with just a mattress and box spring and some clothes. The rest of my furniture (and my manfriend) came the week after–did I mention he left for the week two days after we closed? I feel like I’ve been bleeding money in the last month. I know it’s something that happens with buying a house–we need a lot of paint, but it’s still unfortunate. I’m hoping in August my budget will come back into line, or something that resembles it. It’s hurts not having the second job income too. 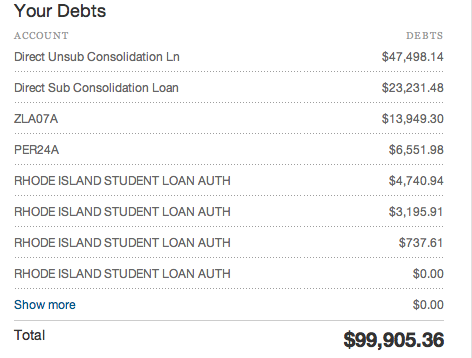 BUT…my total (student loan and credit card) debt is currently $99,905. I might have a bit more interest that isn’t reflected, but I have a payment going through tomorrow. I think that will mean I’m permanently under six figures of student loan debt! Much like my 401(k), I’ve decided not to include the house and mortgage in my net worth calculation. This way it’s relatively consistent in what it’s reflecting. I also feel like the house is worth more (and will continue to be worth more) than what we owe on it, so I’m being somewhat conservative not including the two of them. I don’t expect to see too much movement in things in the next few months–but I’m really looking to about six months from now when it’s bonus and review time–hopefully this will mean some needed (wanted?) house things will be addressed, and my undergraduate loans will be eliminated–or darn close to it. But until then as long as the figures are creeping in the right direction I’ll feel okay about things.